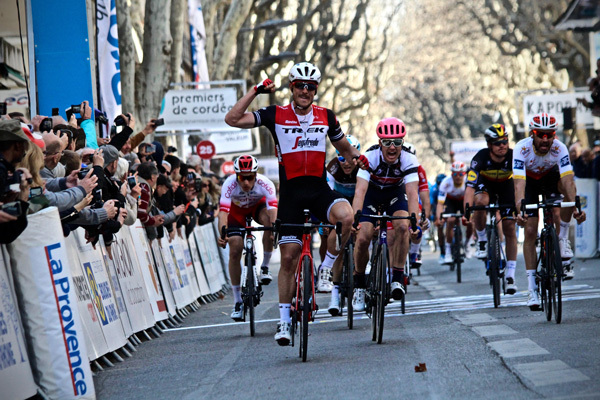 Aix-en-Provence (France) - sunday 17 february 2019 –: John Degenkolb of Trek-Segafredo won the fourth and final stage of the Tour de La Provence ahead of Simon Clarke from EF Education First who gained enough time bonus to equal race leader Gorka Izagirre of Astana on time – but it was the Spanish national champion who was declared the fourth overall winner of the event following Thomas Voeckler, Rohan Dennis and Alexandre Geniez thanks to his advantage of just 13 hundredths of a second gained in the opening time trial. The German winner of Milan-Sanremo and Paris-Roubaix in 2015 claimed his first win of the 2019 season in a sprint finish at the end of an eventful stage that started in style in front of the Popes’ Palace in Avignon. Third on the line of the intermediate sprint behind Philippe Gilbert and Clarke after 12km of racing, Tony Gallopin of AG2R-La Mondiale took a one-second bonus that enabled him to round out the final podium. King of the Mountains Lilian Calmejane from Direct Energie threatened Izagirre’s lead throughout a royale breakaway that also included Stage 1 winner Filippo Ganna. Best young rider David Gaudu of Groupama-FDJ was the last attacker along with Eddie Dunbar of Team Sky. Third on the line, Anthony Maldonado from the French Continental team St-Michel-Auber 93 eventually deprived Gallopin of the final victory as he took third place, and the Parisian had to settle for fourth without any time bonus. 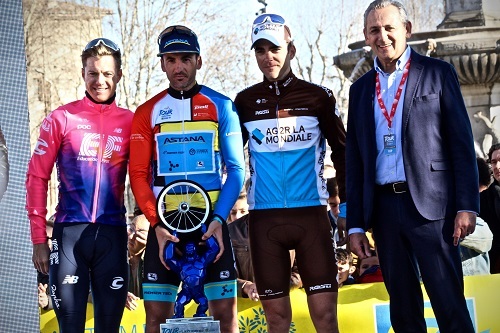 Stage 4 photo gallery, Tour de La Provence winner's audio file, Stage 4 winner's audio file, Stage 4 and final results, race start list and race programme of the Tour de La Provence are available in the link below. 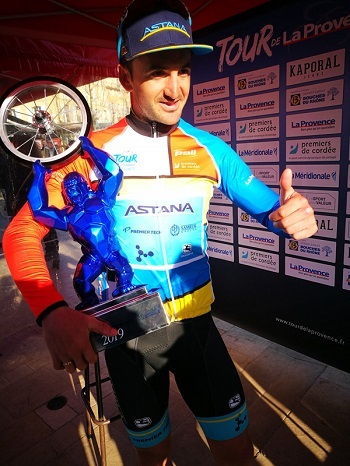 1: First stage race victory for Gorka Izagirre and first overall Spanish winner of the Tour de La Provence. 130: In thousands of a second, the difference between Gorka Izagirre and Simon Clarke in the opening time trial – that’s the margin of the Spaniard’s final victory.